BerandaGabion and reinforcement products help save civilians from the perils of frequent floods. Gabion and reinforcement products help save civilians from the perils of frequent floods. 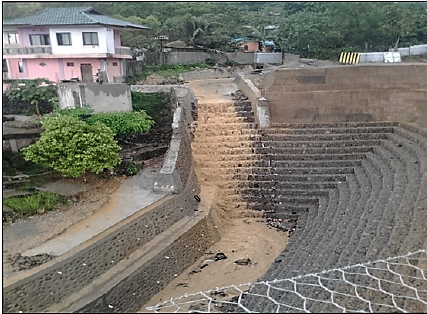 Maccaferri Indonesia has built a reinforced soil slope as retaining structure and a gabion-made drop structure to constrain heavy water flows and mitigate flooding. Indonesia has long faced hazardous landslide and erosion challenges due to frequent sudden heavy rainfalls during which 50% from the average rainfall may precipitate in one go. Vast areas of soaked ground begin to shift and move after such circumstances, oftentimes causing vast damages to the population and vegetation. Landslides have been known to trap vehicles and civilians alike—at times destroying entire villages. Kanawa is located in the North of Ambon Island, Maluku Province of Indonesia. Some areas in the vicinity of the Governor’s property were prone to sliding (see picture before the intervention) and have already experienced shallow landslides during the rainy season. The objective of the Client—The Indonesian ministry of public works—was to stabilize the area using an environmentally friendly solution which could add a “green touch” to the landscape. The total unstable soil height to be retained was approximately 10m. The main technical constraint of the project was the presence of a small river discharging directly at the toe of the slope to be retained. The water was falling straight at the toe of the slope with an uncontrolled hydraulic jump of approximately 10m. It was therefore important also to mitigate the water falling energy in order not to erode the new construction and to protect the slope against erosion. The Public Works Department decided to build a Reinforced Soil Slope as retaining structure and a gabion made hydraulic drop-structure to dissipate the energy of the outflowing water. The Maccaferri Team designed the solutions using the MacStars software and other internal tools. The proposed solution consisted of a retaining structure combining Terramesh Systems at the bottom (the first 6m) and a 5m-high Green Terramesh retaining structure on top of that. This hybrid, bland of solutions provides the customisation needed to introduce vegetation (greening) to the solution. The channel drop structure was entirely made with Gabions and Reno Mattresses. As channel bed, at the bottom of the retaining structure, Reno Mattresses were used to limit the erosion potential of the water flow. All the Double Twisted products used were Heavy Galvanized and PVC coated for a higher durability in river applications. All the stability checks were carried out by Maccaferri to ensure the longevity of the structure alongside with the publics safety. After construction, the drop structure experienced some severe floods mixed with debris. The drop structure and the channel were not damaged thanks to the high strength of the materials used as well as they high quality coatings. The sever flooding made both contractor and the Maccaferri Team aware of the usefulness of Reno Mattresses and Terramesh System—both of which have proven to be valid alternatives to traditional lining systems and retaining structures used in Indonesia both in terms of flexibility, durability and cost effectiveness. For further technical information, please download the Case Study.